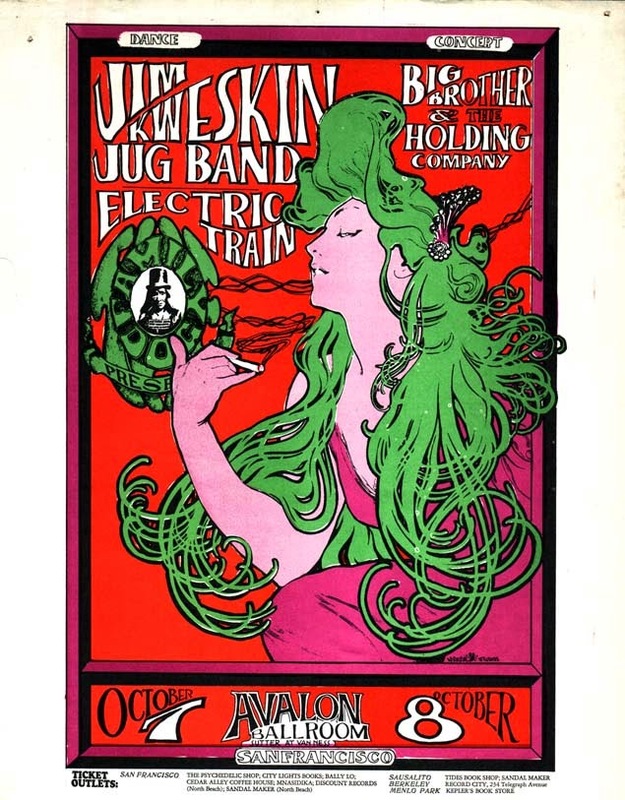 Jamming today in the 'rock room' is a newly circulating mono audience recording of Janis Joplin and Big Brother hailing from the Avalon Ballroom in late 1966. Janis debuted with Big Brother in June of 1966, speculation says that this recording hails from later (possibly Fall) in the year. The band line up includes Janis Lyn "Pearl" Joplin - vocals, Sam Houston Andrew III - electric guitar, "Saint" James Gurley - electric guitar, Peter Albin - electric bass and David Getz on drums. This performance is a beautiful document of the early San Fransisco ballroom scene in both ambiance and musical prowess. The source of this performance is a low generation audience recorded cassette that contains new and never heard before performances. While the recording is in mono and the performance is slightly muddy vocally, it remains relatively clear musically. The energy emanating from the tape is addictive and listened to in the right state of mind, the recording can put you there historically and mentally. The potency of the performance emanates from the magnetic tape, you can smell the smoke, see the light show, and experience the power and grace of the concert. After a brief MC introduction the band rolls into a funky 'I Know You Rider', a favorite cover of San Fransisco bands during this era, eventually becoming a standard for the Grateful Dead. The song twinkles in on a shimmery lysergic opening that then lays into the trademark groovy swing of Big Brother. Joplin voice is staggering as she immediately bounces melodic ideas off of the knotted dual guitars of Gurley and Andrew. Joplin is already stealing the show from her musical compatriots at this early stage as her vocal range acts as another lead instrument, digging deep for notes and then soaring into raspy heart fluttering falsettos. The groove is extremely psychedelic, luminescent, with shimmering instrumentation, contrasting with Jopin's earthy throat. 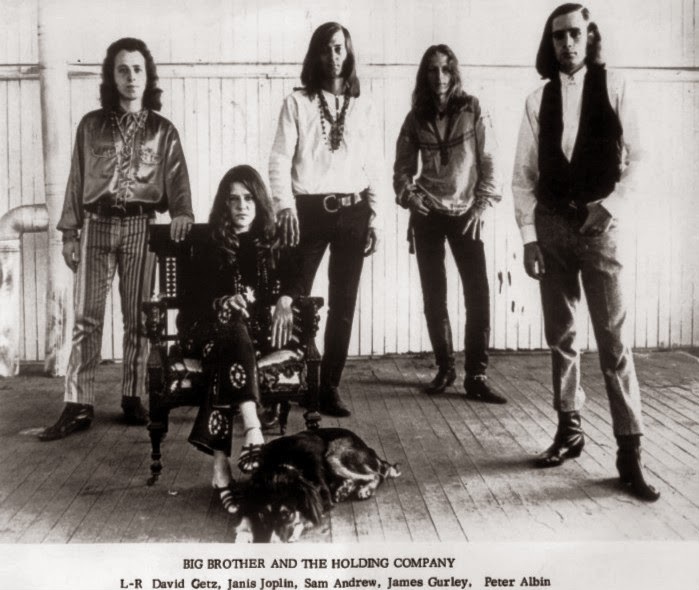 Big Brother was already well practiced in the art of musical exploration well before Joplin's joining of the band. 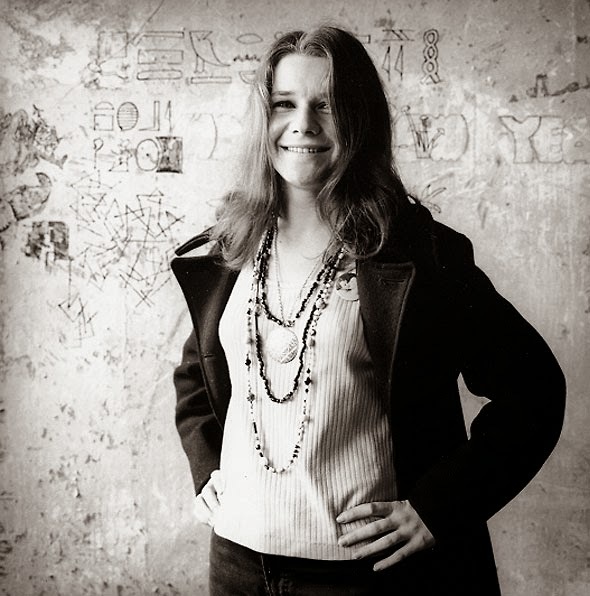 With Joplin's bluesy sensibilities tugging the elevated Big Brother back to earthy realms, the result became a unique psychedelic blues machine, much like fellow San Fransisco band the Grateful Dead and Joplin pal Pigpen. 'It's a Deal,' a contender for bands debut album speeds along at amphetamine rates, quaking kinetically with a punky attitude. Janis lets loose with perfectly timed interjections as the band moves like a comic colored flip book through the songs changes. The Sam Andrew penned, 'Call On Me' follows, a hidden jewel in Big Brother's discography. 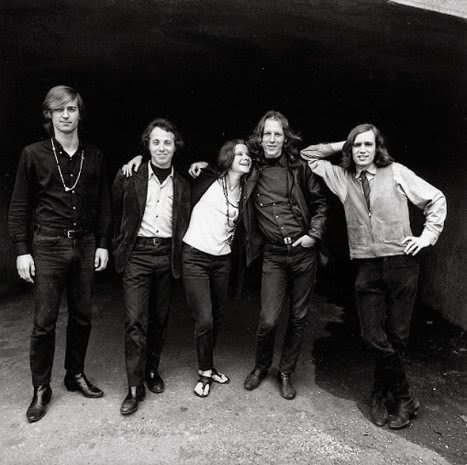 The perfect soul glove slipping perfectly onto Joplin's outstretched hand. The band stoically brings the vibe down, displaying a soulful review. Slightly distorted on the recording, Joplin cuts through the top end distortion with stomach churning vocals. Perfect. 'Combination of the Two' races off of the runway, a streaking runaway rocket disseminating love, detonating into distorted feedback blasts, just before slipping comfortably into the sunny celebratory verse. The second musical guitar excursion convulses with hallucinatory guitar by Houston and Gurley that euphorically spins your head before again dropping into the verse just in time. Joplin again captures the spotlight in a jar with 'Farewell Song', another sample of a soulful Stax groove, becoming a tribal crawl midway through the song before emerging back into the framework of the tune. Janis spits and screams her way aggressively through the changes using the band as a springboard in which to bounce her fervent preaching. 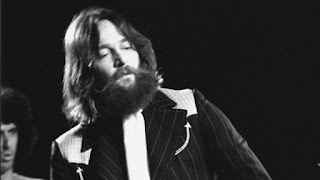 The Peter Albin penned, almost instrumental jam 'Coo Coo', released as a 1968 single dashes like a tripping surfer racing through transparent walls of sea and foam on their uncontrolled journey to the distant shore. The track bubbles on heavy tom-tom rhythms and excited off mic retorts by band members. Albin's puffy bass drives the plush jam into a freaky peak.The core of the San Fransisco sound can be felt through this captured moment on magnetic tape. The band draped in day- glo, expand and retract as an amoebic image commonplace on the light show stage screens during this era. A musical juxtaposition occurs as the band follows 'Coo Coo' with the honky-tonk chunky chug of 'Easy Rider,' found on the groups debut LP. Gurley takes on lead vocal duties with support from Joplin through the chunky saddle ride. The band cant help but split open the traditional framework of the song with a exploratory interlude highlighted by a huge fuzzy caterpillar guitar solo by Gurley. This is good time, boogie down music, the epitome of the 'San Fransisco scene', conglomeration of traditional and exploratory music. The career expanding and concert favorite 'Down On Me' comes next, the traditional tune rearranged by Joplin into a snap crackle and pop tour de force. This song is played with the same psychotropic explosiveness as the previous numbers. The closing number of the groups debut LP, 'All Is Loneliness' is given a shadowy reading here, with twisted rope vocals climbing like vines into cracks and crevasses of the created ancient musical stonework. 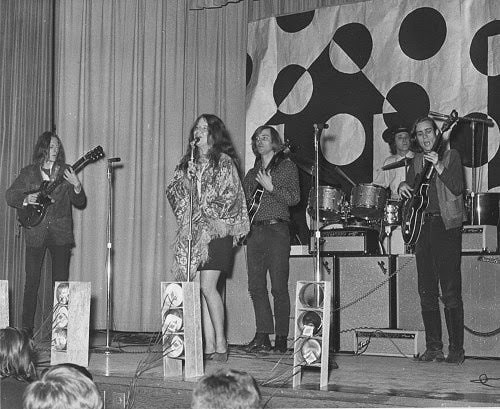 The song dissolves into a jazzy drum interlude by Getz and then traverses a bass heavy breakdown where Janis lets looses with numerous variations on her vocal ideas.The crowd can be heard encouraging the group as they undulate beneath Joplin's vocal directives. Unfortunately the song cuts off after about 7 minutes, it is unknown how much time may be missing. The recording picks up with 'Hall of the Mountain King' a highlight of the concert, already slightly in progress, missing its thematic opening. This interpretation of Edvard Greig's classical piece turns into an expansive puddling meltdown of immaculate proportions. Andrews and Gurley reflect contemporary's, Bloomfield and Alvin Bishop from the Butterfield Blues Band with aggressive and cussing guitar duels. Gurley trumpets massive feedback silver explosions from his strings, while Andrews channels obscure and slippery foreign melodies in reply. At three minutes the song starts to swallow everything in its wake, a black hole of blended sounds, almost collapsing on itself, Getz driving, Albin pushing, the guitarists reaching a vast open area, peaking, staying at the peak. Tension continues to build, finally the swell abates at five minutes. The band cruises at an acceptable level while Andrews explores every nuance of the groove. A bit past eight minutes another disorientating location is reached, explored and left behind. The band increases their motion, again sun-bursting into another psychedelic wash, covering the assembled crowd in a warm multicolored symphonic shower. The classical theme reappears from the sonic debris, dissolving and concluding this massively epic performance. Following the previous musical maelstrom Janis can be heard remarking that the next tune, 'makes you want to get up and dance'. The band slams into the rowdy 'Blow My Mind', with Albin and Joplin sharing vocal duties. During this song Albin jumped to guitar while Gurley switched up to bass guitar. The mid section of the song expands like it has been dosed with Owsley's finest, cracked open like an egg, revealing its soft vulnerable center. Big Brother's practiced stage improvisations are on full display. The 42 second song 'Henry' comes next and is a jerky, acid jazz, fast car with failing breaks that tilts on two wheels around San Fransisco corners. Completely original and oh, so unique as you will hear on the recording, should you search it out. This one was a special treat for the people flying 'trans-love airways' in the assembled crowd. The band closes the show with a heavy and clanking 'Ball and Chain'. At this point in time Big Brother was already entrenched as a well known band in San Fransisco. It's performances like this one of 'Ball and Chain' that pushed Janis to the top of the pile, not only surpassing the band she joined, but making her a superstar surpassing almost everyone. Her gritty attack, her sensual living of the lyrics, and her portrayal of everything that the decade of the 1960's stood for, combined to make Joplin unique bluesy wail, cutting through the psychedelia surrounding her. Her mastery of vocal timber and dynamics is unparallelled and will probably never be equaled. This is no diva singing for show, this is a blues singer singing for dear life, screaming from the deepest depths of her soul. From the sweetest whispers to the hardest most cutting wails. A perfect show closer, and a fitting example of Joplin s uncontainable power and eventual stardom. This recently circulating gift of a performance by Janis Joplin and Big Brother is an impeccable capture of a revolutionary time in rock music history. Historically, politically, musically and throughout all of the arts, things were exploding in technicolor fashion. The recording of this evening in 1966 acts as an aural document capturing all of these elements disseminated through the lens of the forebearers of the 'San Fransisco Sound'. The field recording also finds Joplin in the infancy of her career and popularity, backed by a powerhouse of practiced and virtuosic musicians. Don't miss out, hunt down this recording and get your ticket to a musical time machine.